The rarest gem in the quartz family is a vivid blue or blue-green microcrystalline quartz known in the trade as gem silica. 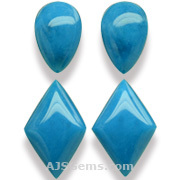 Sometime referred to as gem silica chrysocolla or chyrsocolla in chalcedony, it forms in copper-rich areas where the copper silicate known as chrysocolla combines with chalcedony quartz. The main sources for this rare gem are in Arizona, USA and Peru and Chile in South America. These locations are among the main copper mining locations in the world. Arizona is the leading copper producing state in the US, with 60% of the US production. Copper mining is a multibillion dollar business with many industrial applications. Unfortunately with the advent of modern mechanized mining, it is no longer possible to interrupt copper mining to extract the gem silica when a new pocket is discovered. So the only locations yielding new material are those where mining is still accomplished with pick and shovel. The main sources of gem silica in Arizona are the Inspiration Mine in the Globe-Miami area, and the Ray Mine in the southern part of the state, about 65 miles east of Phoenix. Due to copper mining practices, neither mine has yielded new material in the last 20 years, and all the material in the market was discovered years ago and put aside or held in family collections. The scarcity of fine material has driven up prices on top grade gem silica as demand from collectors continues to grow. The Inspiration Mine is noted for very fine translucent material which has the distinctive glow prized by collectors. Material from the Ray Mine tends to be opaque, but of a vivid blue color. 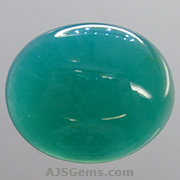 More recently, we have seen new gem silica from Peru enter the market. The first Peruvian material was quite opaque and olive to forest green in color. 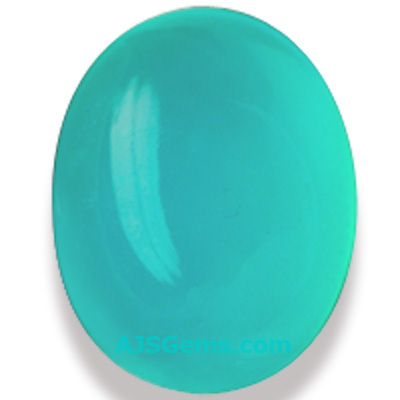 But more recently we have seen some fine blue-green stones from Peru, with good translucency. The main source is the Lily mine in Pisco Umay, about 200 km south of Lima.